Trimming one’s Christmas tree can be an enjoyable tradition year after year, but every once in a while some variation on the established order can be just as fun. 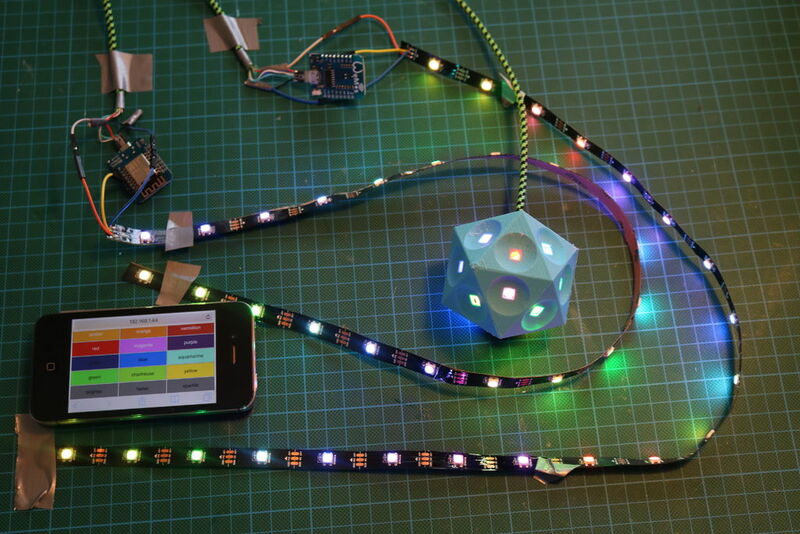 Seeking some new ornaments to and desiring to flex his skills, Instrucables user [Gosse Adema] created a LED-illuminated, phone-controlled, deltrahedron Christmas tree ornaments. Wemos DI Mini Pros are the brains of these little guys, WS2182b RGB LED strips — being the superb go-to’s that they are — light the ornament, and a 5 V power supply keep them lit. [Adema] used the Wemos specifically to create a web server unique to each ornament, and goes into incredible detail on how to program each one — now there’s an arrangement of words you wouldn’t expect to see — providing all the code he used, as well as the models to 3D print the deltahedron. [Adema] also provides steps for a non-wireless version in case pulling out all the stops isn’t practical. Don’t forget to decorate the final product! While this is indeed a merry hedron, one could go the route of a foul-mouthed decoration instead for your custom ornaments. So does your WeMos simply work with ws2812b strips? I have tried three times with mine and ended up burning out either leds or micro each time. What is the trick to it? Did a party light with 7 bottles, 3 ws2812b per bottle, esp8266 (sonoff sv), a dc/dc converter and 6 lipo packs 7.4V. Funniest thing: When the voltage dropped to low, all my lamps begin to turn red. I DID NOT PROGRAM THIS FEATURE! The only difference is the Bascetta Star wrapped around the icosahedron. Maybe due to the lower voltage required to light red LEDs. I’ve had similar things happen with RGB leds when the battery starts to wear down – only enough voltage to light red.